We are going on a big trip next week and we’re driving my car, the RAV4 Jorge, as it gets better gas mileage than CSP’s truck, Q-Tip. Well before we hit the road, Jorge needed new tires, a tune up, oil change, his tags are due, and the state inspection is due. So we’re talking over $1000 at least in maintenance. And he has 90,500 miles on him. Well then we saw the ads on tv where Toyota is doing 0% financing (on 36 months for the RAV4), something they have never done before. CSP started talking a few weeks ago about how we might want to think about trading Jorge in since he’ll soon be needing a new timing belt. Well it seems like the stars aligned for us because I’d like you to meet Blanca! 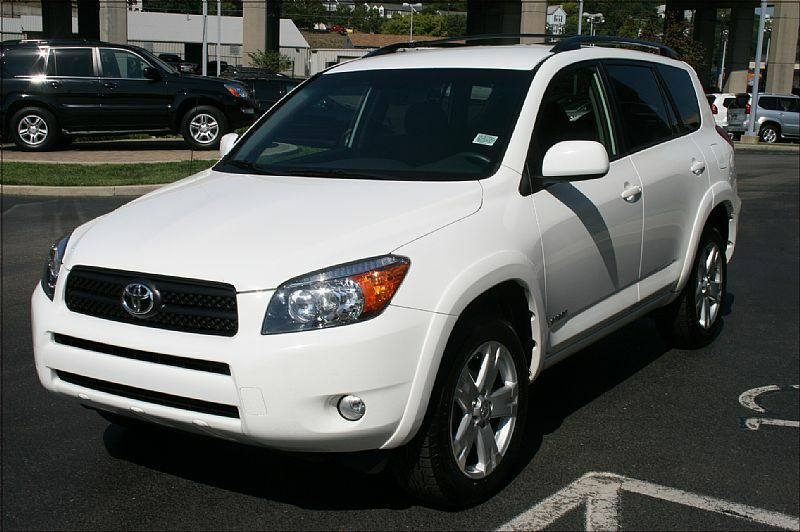 Blanca is a 2008 Toyota RAV4. Jorge served us well for 7 years but we just couldn’t pass up the great financing deals. And let me tell you, the Toyota people were falling all over me to sell me this car. I had 3 dealerships crunching numbers and fighting each other to get the best deal. I was in there alone and I’d call home to CSP to run the numbers by him. He’d say no and they’d get back to work. Eventually we got them down to 3.9% for 60 months, a good bit for Jorge’s trade, and we paid $600 LESS than what we paid for Jorge 7 years ago! Our payments are over $100 less a month than Jorge’s were (he’s been paid off since 2005). Wooot! By the end of the whole thing my sales lady was hugging me. Now here comes the stars aligned part. CSP cleaned out Jorge’s glove compartment and found the delivery sheet that I signed the day we bought Jorge. It was dated 10/16/2001. 7 years to the day later and I was signing the delivery sheet for Blanca! It was sad leaving Jorge in the parking lot at the Toyota joint. He looked all forlorn. I’m hoping some nice college girl buys him and loves him. I’d have told y’all about Blanca when we bought her last week but it was PhoBloDays and all. She’s 14 inches longer than Jorge and now there’s plenty of room for child safety seats! Come on home soon Ling Ling, Mama’s got the new car ready for ya! Fabulous ride!!! How weird you purchased another RAV4 on the same date. Spooky! What a coincidence!!! Blanca is very nice! And what a great deal. Congrats on Blanca … he (she?) is sooo cute. I really wanted a Rav 4 when we went car shopping last year, but I ended up with a Highlander which I absolutely LOVE (needed the space for the babies). Ravs are so cute! But it is hard to say bye bye to a car. I bought my current minivan with Lydia in mind. BEFORE Gene ever said yes to an adoption. I just knew she was going to love the DVD player, and by golly, I was right. About the adoption and the DVD player! Come on over, Ling Ling. Shanny & CSP are ready. What a lovely new car! 🙂 I always name my cars but my latest car, the name of the color is a metallic brown-orange color called “Rootbeer” and so that’s what it’s name is. When I drive it I say I’m “Rollin in my Rootbeer”…! Yes! Hurry home Ling Ling! Good bye Jorge. Hello Blanca! ohhh I love the new car… I really like the Rav4s… but Jeremy never liked them… but I would of loved one for the up coming winters hehehe… congrats!